The latest innovations in dentistry transform the diagnostic and treatment process for both the patient and your dentist in Chesterfield. Our modern dental practice strives to promote your comfort while you are in our office while delivering the superior services your smile deserves. Among one of the many advanced technologies you will find in our office is i3D imaging. The revolutionary technology gives Dr. Jeff Yenzer a superior view of your oral structures for efficient and precise treatments. 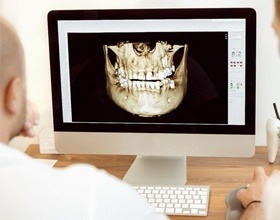 Now, Dr. Yenzer can view in-depth 3D images of your mouth and oral structures using a simple scan. 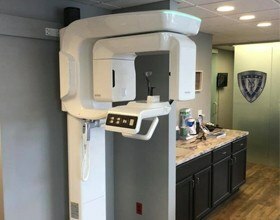 The scanner provides a complete picture of your oral health in a matter of seconds, allowing your dentist to see even the smallest of detail that is not possible with traditional imaging, like a digital x-ray. The 3-dimensional images show your teeth, soft tissues, nerve pathways, and bone in a single image. Dr. Yenzer can enlarge the picture to evaluate your oral health with greater accuracy. This allows him to create more precise diagnosis for effective treatment planning. A series of small radiation beams produce a series of digital images, which are collected and formed into a single picture. They are converted to a three-dimensional model to aid a variety of dental purposes and procedures, like the planning of dental implants. Efficiency: Provides a complete view of your mouth in a single image. In-Depth: Highly-detailed images provide extensive insight into your oral structures and pathways. Safe: Reduced exposure to radiation when compared to other imaging methods. Comfort: Biting onto film strips and messing impressions are no longer necessary. Convenience: Spend less time in the dental chair with the complete scan performed in a single rotation. Accuracy: The high-resolution images allow your dentist to see every detail in your mouth for accurate dental procedures. Interactive: Yenzer can view the images on a large screen and can zoom in on specific areas. The images can also be manipulated to see every detail in your mouth. Cost-Effective: With the technology in-office, it eliminates the fees associated with a third-party imaging center. How Can i3D Technology Help Me? Cosmetic and Restorative: The images help your dentist prepare for reconstructive or oral surgery when needing a complex treatment, such as dental implants, root canals, or bone grafting. Orthodontic: The technology helps create a map to move your teeth into their correct positions. Implants: The technology integrates with elite software to assess the health of your jawbone while also determining the precise location for the placement of your implant posts. You deserve to benefit from the best when it comes to your dental care. Enjoy state-of-the-art imaging with Dr. Yenzer. Contact our office today to experience a different side of dentistry.